During a recent trip to India I was most privileged to be shown a community based education program being run by a group called "Pratham". The Programme Director, Madhav Chavhan, and his team have done an extraordinary job making education available to 140,000+ children throughout India who might not have had the opportunity if it were not for the Pratham programme. Pratham is a public charitable trust and its aim is to create a societal mission for achieving universal pre-primary and primary education throughout India by the year 2010. Pratham's goal is simple: "Every child must go to school regularly and learn well". It therefore follows that all Pratham's efforts and initatives are linked to the existing government school system and directed at improving access to schools, increasing attendance and raising achievement. · In-sweatshop teaching. 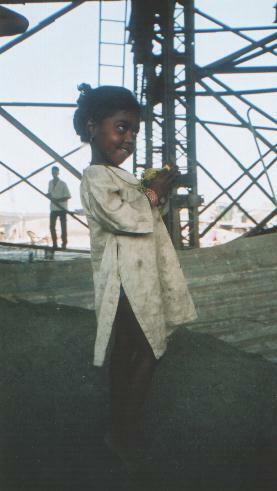 Children as young as 7 years of age work 14 hours a day, 6 days a week in the sweathshops of the large cities in India. Pratham provides an educator who goes into the sweathshop and teaches for 1 to 2 hours per day. In 6 months they have enrolled 8,000 students in this program. · The balwadi ("preschool") program-Pratham's oldest, serving 53,000 children-provides classes for three- to five-year-olds not enrolled in other preschools. · The balsakhi ("child's friend") remedial program places teachers' assistants in municipal primary-school classrooms to help lagging children at risk of dropping out. Started in 1998, the program now serves roughly 35,000 children. · The bridge course program targets children aged six to ten who have dropped out of school or never attended one. The program aims to educate children sufficiently to enroll them in municipal schools. Started in 1998, it now serves 12,000 children. · The 13 pratishristi ("parallel universe") computer-assisted-learning centers in municipal schools were created in 1999 to familiarize children with computer technology and to enhance traditional learning. These centers now reach 8,000 children. After school and during holidays, the centers are used for adult computer training. Pratham has now helped start educational programs in 12 other Indian cities and regions, with an additional 13 planned in the next 6 to 12 months. The organization serves 35,000 children outside Mumbai-a number expected to grow to 70,000 by the next school year. Pratham plans to establish programs in the 300 largest Indian cities by 2005 and to have nationwide universal primary education by 2010. Click on contact for more information about Pratham.